Noodle-ing around the internet recently, I stumbled upon a youtube video about GMO foods. It was rather shocking with regard to the potential for health problems. I was also shocked to learn that baby milk formula has a high level of GMO content. The video said there are just 9 crops that are GMO. These are Soy, Corn (but not popcorn), Cotton seed, Canola, Sugar beets, Papaya, Zucchini, Yellow squash, and Alfalfa. There used to be GMO wheat, rice, toms, potato, and a few other things. I began to wonder, how one might resist buying GMO food here in Hong Kong? Another article informs me that China only in Feb 2012 put policies into place to stop the distribution of genetically modified rice, what is unclear from the google translated article I read was whether that was to happen now, or sometime in the next 10 years. Chinese language does not have tense, so it is difficult to know when exactly something is to happen. I do know that Monsanto, the largest producer of GMO seed is looking closely at China and licking its lips. This is a market they have not penetrated, but which has much opportunity. The long and the short of it is that GMO is likely to be, if not already, in China in a big way. Given the narrative that GMO is important for food security, despite evidence to the contrary, it is surely likely to have a future place in the crop system of China. It is certainly well documented that the big seed companies seek to control the supply of the seeds that grow into the foods we eat. What is more, they are a powerful lobby, which is why the US does not have GMO content on its food labels even now. They are big because there is money to be made. GMO foods can be avoided. The easiest way to avoid GMO foods is to not eat processed foods as GMO foods make up 70% of what we find in the supermarket. If there seems to be an echo about processed foods, it is because recently the news was reporting findings from a study that confirms that processed meat (not ground up, but meat that has preservatives like salt, sugar and other things) is linked to health problems and early death. So it seems simple, unprocessed food, whatever type is best. Another way to avoid is to buy food that is labled as non-GMO or which has no GMO food listed on its label. Foods from Australia that are non-GMO are labelled as such. European foods similarly have regulations. Since 2004 foods produced in Europe where there have been GMO crops as part of the process must be labelled as having this content. There are several more expensive groceries here in Hong Kong that sell goods primarily from Europe, Australia, and the US. To avoid GMO foods Hong Kongers could buy foods from Europe and Australia, but not necessarily the US as there is not a law about labelling in the US and probably the food is GMO. Fine for much of the expat community, as this is a group that has more money to spend on food than many here in Hong Kong, but it leaves the poor in a ditch, so to speak. One can certainly buy organic food. Organic food is sold in a whole range of locations. The large supermarket chain, Wellcome, has an upscale organic store called 360. Wellcome is owned by a company called Dairy Farm, which is part of the Jardine Matheson group of companies. Jardine Matheson is an old, and originally colonial, firm, which was involved in trading between China and England, and many say the trading that led to much of the social problems in China concerning Opium. If buying from this company doesn’t politically resonate, then there are also a number of organic farms and gardens in Hong Kong and there are organic market traders in Kowloon City Market, Shatin Market, and in Tai Po Market. I am also aware of a box scheme that my friend Daisy has some role in, where you can get a box of whatever is fresh (but mostly involving lots of green leaves). There are also a couple of shops over in Central that sell organic food and one of the Dai Pai Dong’s at the bottom of our road has organic food on a table that you can buy alongside a wonderful dish of greasy pidgin and fried tofu. Finally, you could grow your own, and also in the process avoid the dependence on government regulation and testing regimes, which we know are not infallible. 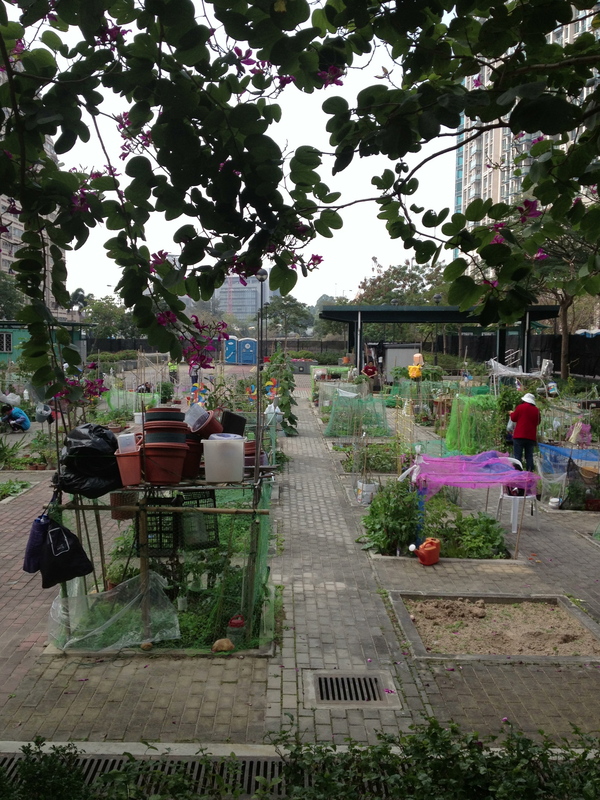 Like most cities, gardening in Hong Kong, at first look, doesn’t seem that easy. Those who live in the villages around Hong Kong tend to have more space to garden than most Hong Kongers. There are some allotments here, but very few, and what you get is more paved than plantable. So land on the ground for city dwellers is scarce. Postage stamp gardening in Hong Kong. But, there is a lot of roof space in Hong Kong, which is ripe for the planting. Hong Kong Farm is one venture that is using homemade compost and the top of an industrial building as growing space for fresh veg. Hong Kong could take a leaf out of the book of places like Todmorton and Hebden Bridge in the UK and go in for a bit of guerilla gardening. I understand the Create Life group is aiming to teach people about gardening in Hong Kong. Indeed, HK has a lot of potential for gardening, as what one might think of as summer crops in the US or the UK grow well as winter plants here, where there is a a lot of sunshine and it doesn’t get too cold. I’ve got a pot of tomatos growing right now on my balcony. To guerilla garden you just need what is effectively an abandoned or neglected space. Green walls and roofs also seem to have captured the interest of those in HK who are concerned about the air quality. One wonders if there is not also the potential to use some of this newly found vertical land as food producing space as well. I know I am not the only one thinking along these lines. I am sure, if we put our minds together solutions will just come out of the woodwork. I would love to get comments from people who are finding spaces for planting their own food in cities (all over the world) as well as the strategies people employ for avoiding GMO foods. For information about HK policy on GM foods and food labeling see this consultation document here. As of May 2013, the current state of play in HK is that if it is fit to eat in the country that exports it, it is fit to eat here. What is more, any GM labeling is purely voluntary. For more on the more western consumer focused organic stores see this blog by Sassy Mama, which lists several options. Green Queen has a longer list that also includes some farms, but not all the links work. If you are in Hong Kong and want to be part of a box scheme, then try Homegrown Foods. If you want to know about guerilla gardening in Todmorden look here. Here is another link about HK farm, from the wonderful Urban Photo. To learn more about the Organic food sector in Hong Kong you can find a document produced by the HK government here. Whole Foods: Products will carry GMO labeling (miamiherald.com). I have real issues with Whole foods, and given the name I would have thought this was something they did already. Apparently not until 2018. This entry was posted in Food, Hong Kong and tagged China, consumption culture, environment, food, Genetically modified food, Genetically modified organism, GMO, gmo crops, grow your own food, guerilla gardening, Hong Kong, Jardine Matheson, organic food, Urban by geofoodie. Bookmark the permalink.